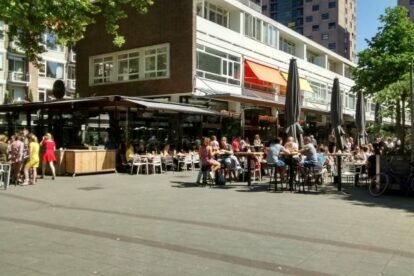 Just a few blocks away from the Markthal, in front of the Nine Bar and across the street from Tante Nel you can find Bokaal. It’s located on the corner of a cosy square called the Nieuwemarkt, a square full of small boutiques, bars and restaurants. One of the reasons why I like Bokaal, next to the relaxed atmosphere, is the variety of beers they serve. Brands ranging from heavy Belgian beers to lighter beers from Dutch soil. Try the Tripel Karmeliet but don’t blame me if you wake up a bit dizzy next morning. Next to decent beers they have designed a menu with snacks that all go well with the beers served. Ask the waiter to get to know the best combinations. Bokaal has an excellent indoor bar which is often more than necessary in Rotterdam but if the weather allows you can spend your evening on the terrace outside. In winter they will turn on the heaters. It makes Bokaal the perfect spot to hang out after a day at work, the weekend and.. well. Actually any reason will do.